SilverSneakers is an overall wellness program that helps you improve your health and live the life you want. 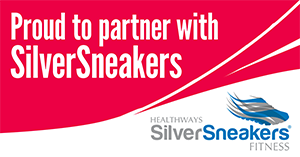 SilverSneakers is offered to Medicare-eligible and group retiree members of participating health plans. Eligible SilverSneakers members receive a basic membership to the Recreation and Wellness Center at no additional cost. Call the number on your health plan ID to learn more. What do I get with SilverSneakers? Whether you're a beginner or a seasoned pro ready for the next challenge, SilverSneakers offers a variety of options for all fitness levels and abilities. SilverSneakers gives you access to equipment and classes. SilverSneakers members at the UMSL Recreation and Wellness Center are able to attend group fitness classes at no additional charge and they have full use of our 100,000 square foot facility. What if I already have a fitness membership? If you are currently an active dues paying member at the UMSL Recreation and Wellness Center, and you’re eligible for SilverSneakers through your health plan, please contact our Assistant Director of Marketing and Membership, Emily Davidson, at 314-516-2347 or davidsoneb@umsl.edu to update your membership accordingly. Bring your SilverSneakers card to the Triton Trading Post at the UMSL Recreation and Wellness Center, and one of our Member Services Staff will be able to assist you. For working out, wear comfortable clothing and well-fitting athletic shoes. View the UMSL Recreation and Wellness Center policies. The UMSL Recreation and Wellness Center is handicap accessible. Do you offer any SilverSneaker Classes? Yes, we currently offer Group Fitness Classes, with some geared towards SilverSneakers (check the Group Fitness Schedule for days/times). SilverSneaker Members can attend any of the classes on the schedule.